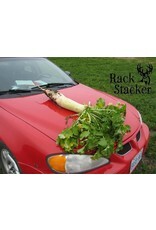 Home / Rack Stacker Big-Uns Radish 10 lb. This seed is known to grow in really tough conditions between rocks, sandy soils and even wet areas. We recommend mixing it with one of our existing seed blends. One straight seed for one plot is never a good idea. 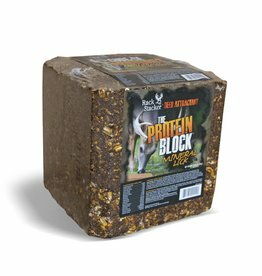 Whitetail deer are natural foragers and they like variety in their diet, just like we do. 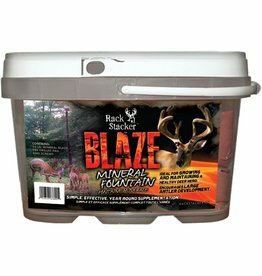 By blending Big-Uns with another seed blend of Rack Stacker Food Plots, not only will you see deer hammer this after frost, you will see them hold up in that area and not wanting to leave. 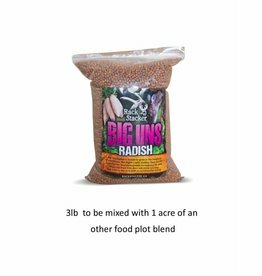 Big-Uns Radish provides not only an absolute crap load of food for the fall and into the winter months but it also benefits the soils tremendously. 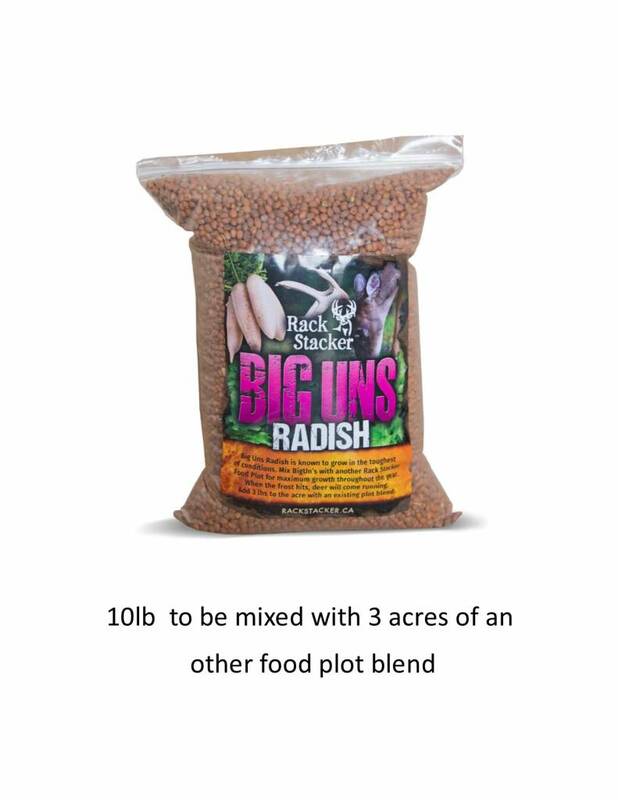 Big Uns, combined with another Food Plot will increase aeration in the soils, as well as increase the nitrogen in the soils while providing more organic material for other plants in the future. 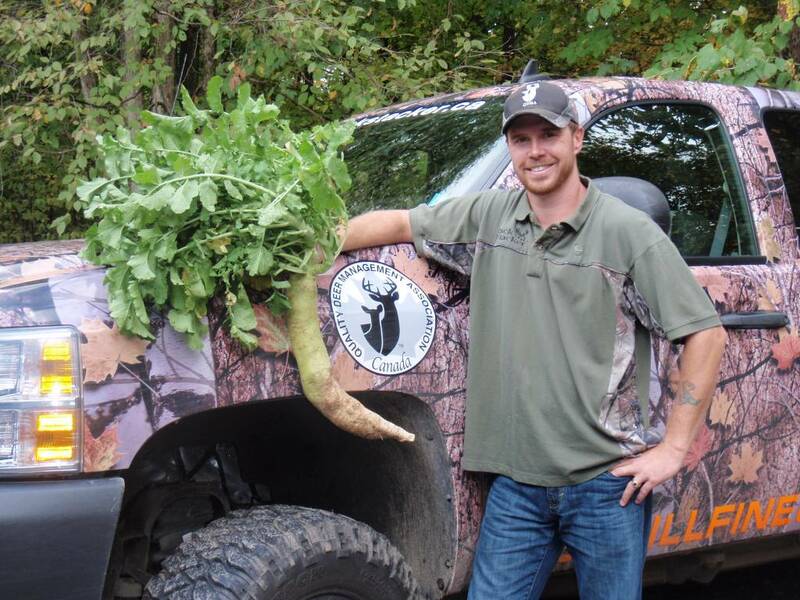 The sheer size of the Big Uns Radish is astounding and when planted in the spring of the year can reach 10-12lbs PER plant. The Early parts of the summer is the best time to plant with an existing plot. In Southern Ontario its around end of May. As long as there is no chance of frost, its go time. 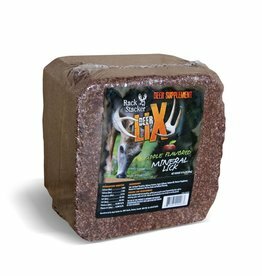 You really want to make as best seed to soil contact as possible when planting Superb-uck. Spraying the plot with a herbicide is the best, you don’t want weeds competing for moisture, nutrients on the fields. After spraying, using a set of disks or cultivators are best. 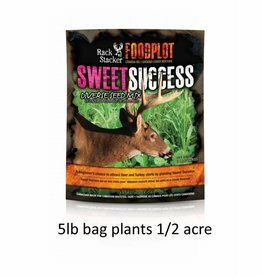 As long as you have something that can scar the ground enough to allow the seed to have good seed to soil contact then you will be successful with Rack Stacker Food Plots. 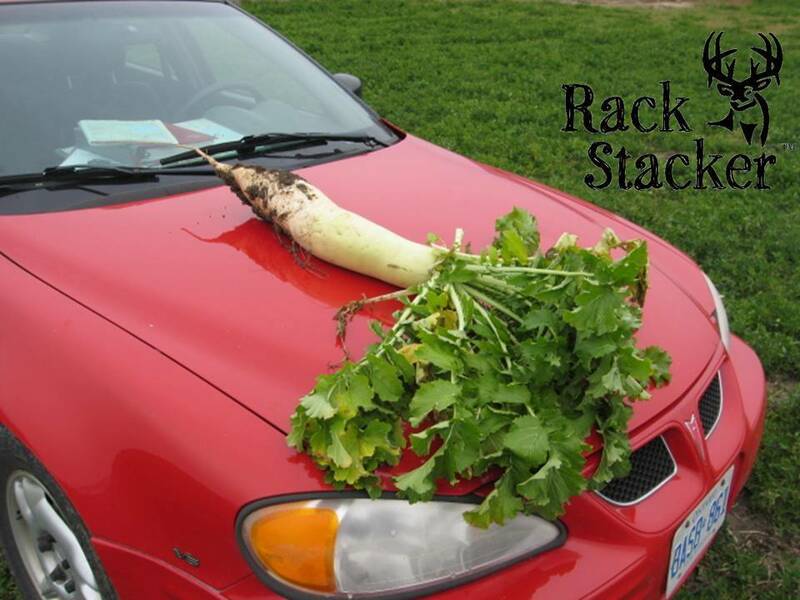 The Rack Stacker Guy (Steve Elmy) says that he only goes down 2 inches, there is no reason to go any deeper, as the seeds will find their way as the roots are developed. Before seeding down your plot you want to drag the soils as level as possible as well. The smoother the soils the better to prevent channeling during the rain and keeps the birds from eating your seed. You don’t need to have the seed disked under. You only want to make the seed hit the ground, and then pack it to the ground with a roller or a calti-packer. This will ensure that there is no air pockets that may disrupt the growth of the plant. If you spray 2 weeks prior to working the land, you can have it in the ground,(disking, dragging, seeding and packing) in 4 hours for about a ½ acre plot. 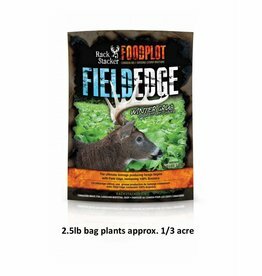 Not a lot of time for a ½ acre plot when you think about the 40,000lbs of forage it can produce in 90 days. That’s a lot of food available for your herd throughout the year. We sell Big-Uns in 1lb, 3lb, and 10lb bags. (Larger bags upon request). 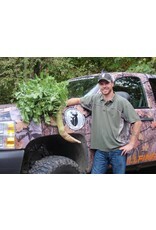 Remember, this is to be mixed with another food plot offered by Rack Stacker, not planted alone. By increasing the diversity of the plot you will have more pulling power for local game animals. Measure the location of your plot. Length X Width divided by 43,560 that will give you the size of your plot (Ex. 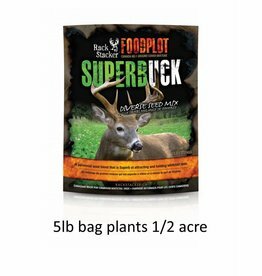 150ft X 100ft=15,000sq ft 1/3 of an acre) you will be able to plant 22,000 ft with a 5lb bag of Superb-uck mixed with 1lb of Radish. Be sure to plant the right amount of seed for the area that you are working with.